Did you launch a campaign to encourage people to ride the bus or take alternative modes of transportation? Helped consumers master a new parking payment system? Instituted a pedestrian safety program? Successfully re-branded the parking, transportation, and/or mobility department? Engaged in a social media campaign that helped drive results? Used marketing tactics to change behavior or solve a problem? Is your organization a parking authority, city, or institution with a parking, transportation, and mobility department, parking owner, or service or product provider serving the parking and/or transportation industry? Did your organization have a marketing, public relations, or communications program or campaign that promoted a new or re-invented product or service that achieved measurable and favorable outcomes? Did that program or campaign help foster understanding of the importance of parking and mobility, knowledge about trends, or awareness of best practices? Did the program or campaign take place, at least in part, during 2018-2019? The entire entry process is online and the fee is only $100. 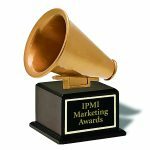 Winners, including a few considered the Year’s Best, will receive recognition and a trophy at the annual IPMI Conference & Expo. They will be featured in IPMI’s monthly magazine and in industry-related publicity and social media. For more information, contact marcomm@parking-mobility.org.